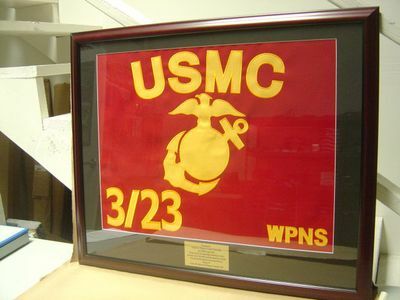 This beautifully framed USMC Guidon features a 15" x 22" Cotton single-sided Marine Corps Guidon framed in a 21" x 26" Cherry wood finish frame with a Brass engraved plate centered below the guidon on a black field. The Letters, Numbers & EGA are appliqued just like the flyable ones and make a great presentation or retirement gift. Only the finest materials and craftmanship go into each and every one of these. To order, please provide the Bottom Left & Bottom Right Unit Information and Engraving Info in the text blocks above. Engraving option includes up to 100 Characters. Each additional character will be charged at .20 cents. Please allow 2-3 weeks for shipping as these items are custom made. RUSH ORDERS- When this option is selected, orders will be shipped in 12 days.